Selected as Party of the Day on February 22nd! 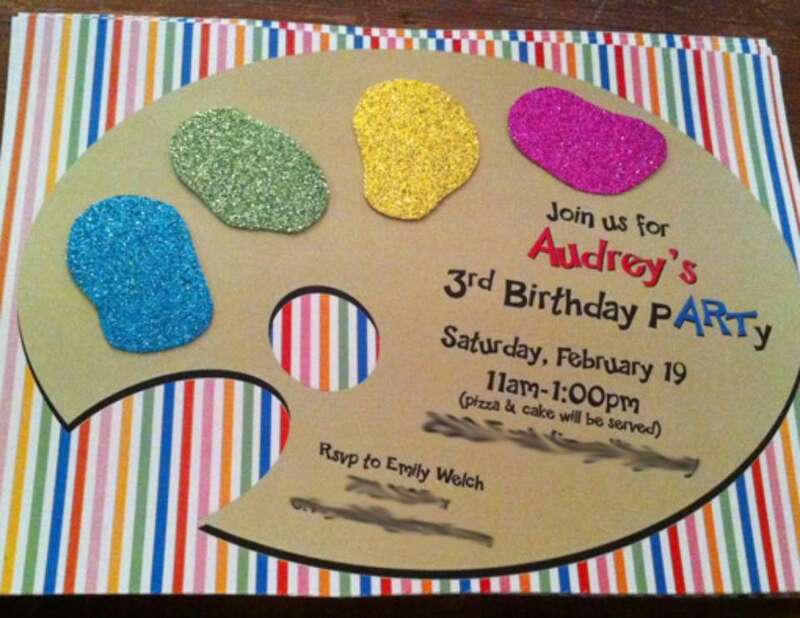 When it came time to plan Audrey's 3rd Birthday Party I was stumped as to what to do and she had no ideas either. Then it came to me to since she loves art so much it only made sense to incorporate her party with something I do everyday - ceramics. I found a bright stripe fabric at my local Hobby Lobby to serve as my color inspiration. From there I designed the artist palette invitation with the stripe background based on the fabric. I then cut glitter paper into organic shapes and glued them to each invitation to serve as the paint. I made a tissue paper garland to match the colors of the party, hot pink, aqua, orange, purple and lime green. 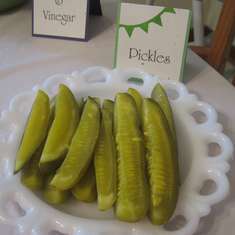 They were hung on a wonderful aqua twine I purchased from the Twinery. Glittered party circles matched the glittered paint splotches on the invitation hung from the chandelier along with mini tissue flowers from my local Party City. Each guest was allowed to choose between a cat, dog or horse to paint. After the party they were glazed and fired and sent back to Audrey's school for the kids to take home and display. A party hat was placed at each seat for the child. I glued large pom poms to each hat for another burst of color. The party food was pizza, decorate your own cupcakes and colored fruit drinks in orange, purple and red. Custom cupcake toppers, drink flags, party circles and water bottle labels were designed to match the invitations and the fabric backdrop. This art pARTy collection will soon be available for sale on my website. The adorable polka dot and solid cupcake liners were purchased from The Bakers Confection. They even let me put together a custom order that matched my party theme colors! Since my daughter is highly allergic to eggs I can't purchase one at a local bakery so I made the cake myself. This was my first attempt at fondant and while I think I did pretty well I'm pretty sure I will stay a loyal Two Sugar Babies customer and continue to purchase fondant decorations. Audrey's cake was placed on a Happy Birthday plate I made for her first birthday. You can order your own Happy Birthday plate in a variety of colors for sale on the Magnolia website. I fell in love with the balloon wreath tutorial I saw on How Does She and made one. Then I realized I didn't really have a place to hang it so I took it apart and made two balloon topiaries for the food table. I was so pleased as to the way they came out I put one in each of my kid's rooms for decoration. A tutorial for these topiaries will soon be available on Catch My Party and my blog as well. 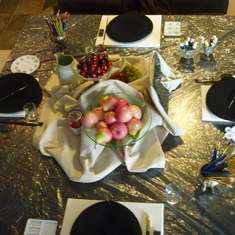 To go with the art theme all the tablecloths were covered in brown art paper and colors we placed in cups everywhere so kids could draw and be creative. I had a friend of mine who is an illustrator draw a picture of Audrey to have as a coloring sheet and an extra activity for the party. The kids loved them and Audrey really got a kick out of seeing herself as a cartoon. 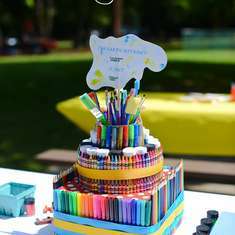 The kids received favor bags with more crayons, mini drawing pads, bubbles and suckers in a cello bag with a topper to match the rest of the party collateral. Sooo what I would expect from Emily and Magnolia Creations! Absolutely adorable - can't wait to see what you do NEXT! OK, this is CUTE CUTE CUTE!! The whole party - very fun! Love all of the bright colors too! Can you please tell me where you purchased them custom illustrated coloring pages? Thank you Emily! I sent an email to you! Hi, I was wondering where did you get this done at? Thanks. Do you by chance have a template I could use for the paint palette?